Names tell of the history or significance of a place. 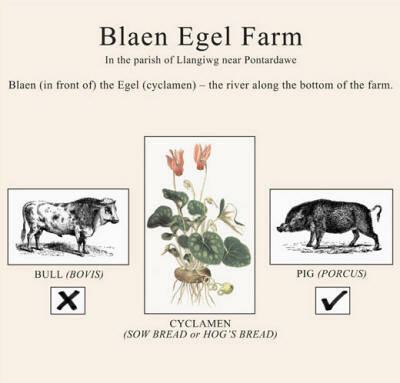 The name of our farm, Blaen Egel describes it as being ‘in front of’ the Egel – the name of the river that runs along the bottom of the farm. However, the meaning of Egel has been less than clear. The most probable meaning, and one supported by the following conversations had with farming neighbours when we moved into the farm, is that it is ancient Welsh for the plant, named Cyclamen or Sow Bread. Both Cyclamen and the juice of the tuber are poisonous to man, but the tubers are sought for and eaten by hogs with impunity. Image & text 40" x 40"